Interesting how things change in a month’s time. A few weeks ago, J and I were at her parents house in Chicago and her mom had just got information about retiring. She has worked for the same Chicago area grocery store chain for 32 years. A few weeks ago, they offered a pretty good retirement deal, but she had to take it by today. Last week, she put in her notice and today was her last day. As soon as she got off work, she got in the car and headed to Kalamazoo. J and I have been here almost six months and her parents have not been able to make it up here. Even though J’s mom had been with the same company for 32 years, she couldn’t get weekends off. Don’t have to worry about that anymore. After giving the tour of our apartment, J said we should go to dinner. It was a little after 4:30 and none of us had really eaten. J picked up a few tacos from Taco Bell for us for lunch, but it wasn’t much, so we decided to go back to the very first place we ate at in Kalamazoo. 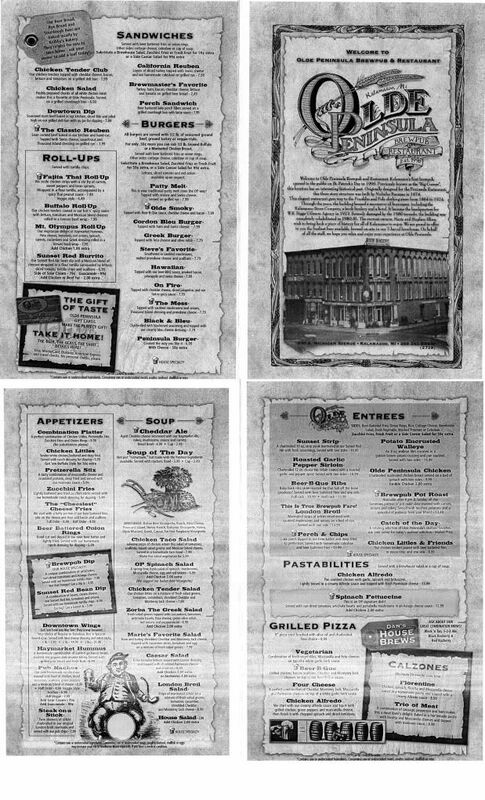 The restaurant that gets that distinction is Olde Peninsula Brew Pub on the corner of Michigan and Portage in the building once known as “The Big Corner.” The building was originally designed for the Peninsula Restaurant in 1874. Over the years, it was also a clothing store, a stove company, a book binding business, and even a hotel. 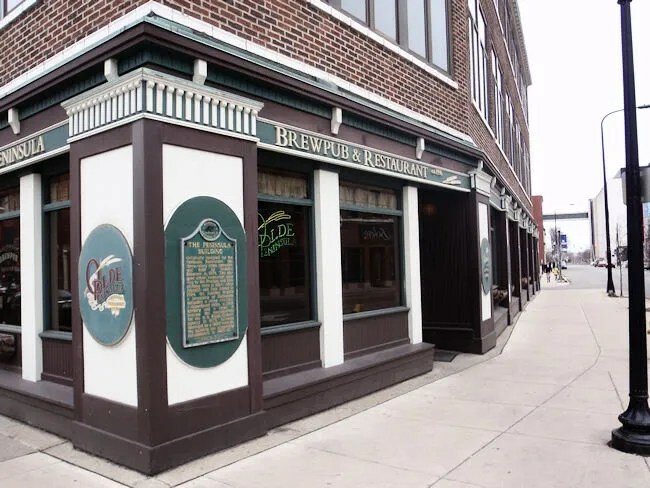 In 1996, the building opened as Olde Peninsula, Kalamazoo’s first brew pub. Today’s trip was actually the second time J and I have been to Olde Peninsula. The first time was in the fall of 2008 when we still lived in Lansing. J was working over here after a trip home, so we set it up with J leaving her car at work for the weekend. On the way back, I dropped her off here for her shift, but first we went to dinner before I headed back to Lansing. 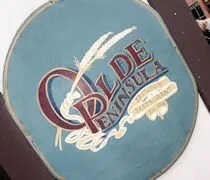 We didn’t really know much about Kalamazoo dining, but I was able to find Olde Peninsula doing a simple Google search. We both enjoyed that meal and thought it would be a great place to take her mom. The hostess station for the restaurant is sort of on the corner of the bar. When you enter the building from the Portage Street side, there is a non-smoking dining room to your right and left. If you go straight, you’ll come into the bar area and run right into the glass enclosure where the vats are. The host took us to a table in the dining room to the left along the windows on the Michigan Avenue side of the building. The drink menu was already on the table and J’s mom grabbed it. J and I both got Coke’s, but her mom wanted a beer. After all, she had something to celebrate. At first, she asked for the Harvest Ale, but the waitress told her they didn’t have that and tried to push her towards the seasonal beer that replaced it, Stout Chochula. She didn’t want an ale, so she asked if they had a different kind of lighter beer. They did have one and since it was happy hour, she got a 22 oz. After getting drinks figured out, we decided to start with an appetizer. We got the “Cheesiest” Cheese Fries. That names no joke. 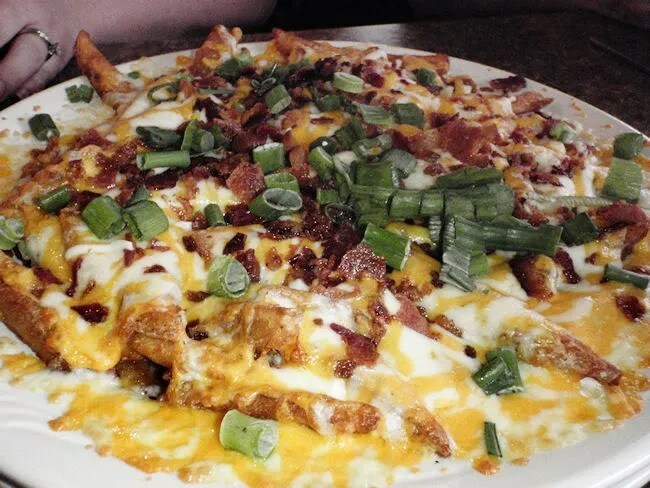 The dish starts with O.P’s beer battered fries then it’s covered with cheese, bacon, and scallions. These fries were really cheesy. J and her mom were both polite and pulled sections of the fries on to their plates. I was more of a Neanderthal and just sort of picked at the plate. I didn’t plan on eating many because I was getting fries with my sandwich, but they were so good. I hope I didn’t gross the ladies out too much, but it was very hard to stop. There was so much crispy bacon on top of a very thick layer of melted cheese. We all decided to go with sandwiches for dinner. 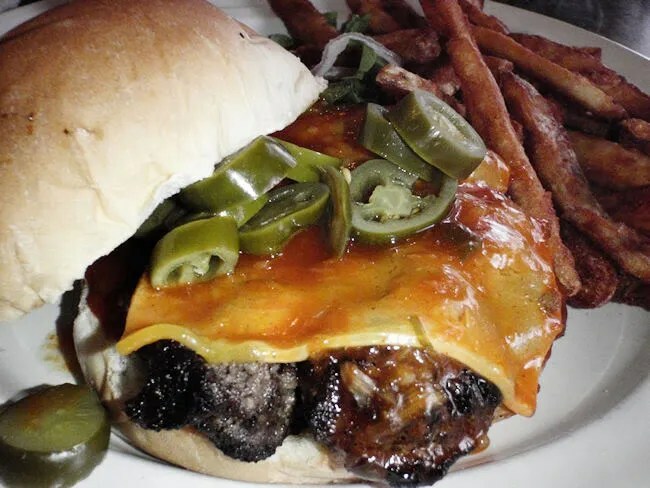 I kicked things off by order the On Fire which is a 1/2 lb seasoned ground beef burger topped with cheddar cheese, jalapenos, and a hot-n-spicy sauce. When I got the burger, I thought I smelled Catalina dressing. The sauce was the right color and consistency, but it did taste at all like salad dressing. The burger was a little overcooked, but it was still fresh meat that had a good seasoning. Everything about the sandwich was spicy. 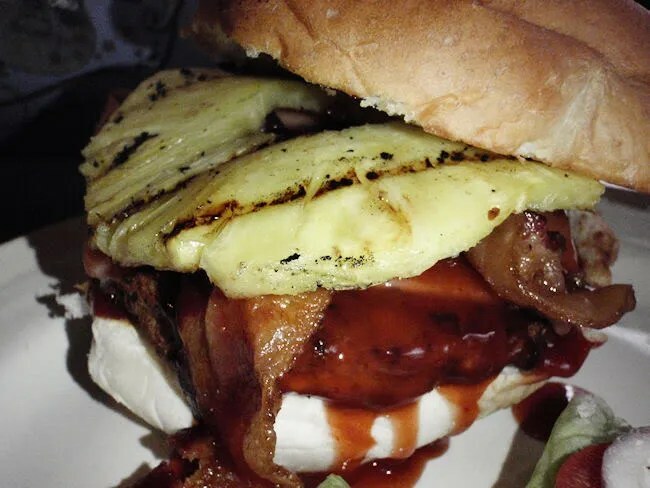 I really think the sauce on the burger gave it more of a kick than the jalapenos did. The sandwich came with choice of a side and instinctively, I chose fries even though we ordered them as an appetizer. I did my best to resist them, but it didn’t really work. The beer battered fries are deliciously golden brown and very crispy. They’re very hard to turn down. J’s mom ordered the Mt. 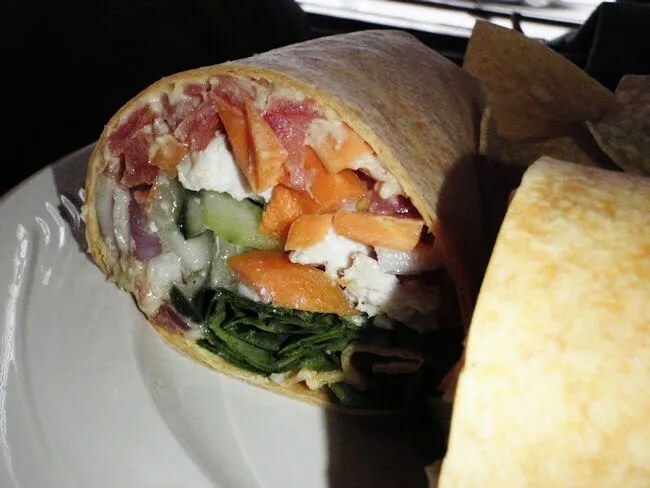 Olympus Roll-Up which the menu calls a “vegetarian delight.” The tomato basil wrap comes with Haymarket Hummus, feta cheese, tomatoes, red onions, spinach, carrots, cucumbers, and Greek dressing. She said the wrap was delicious, but the carrots should have been cut up smaller. They were hard and crunchy in the wrap and while they added flavor, they really did a number to the texture of the wrap. Her wrap came with tortilla chips, but she didn’t really get a chance to touch them. Like the rest of us, she filled up on cheesy fries and took more than half her wrap home. In the food department, Olde Peninsula delivered again. All three of us had fantastic sandwiches and the cheese fries we started with could have been addicting. Service was a little slow. It wasn’t even really a rush time and dinner took over an hour. Instead of bringing our check when she took plates, our waitress did three other tasks before dropping the check off…and that was after we sat with empty plates for quite a while. Once she did drop the check off, she never came back. I finally got up and walked it over to her, but even then she was too distracted socializing with another waitress. We paid cash for the $44 bill, so we didn’t have to wait for change which is probably a good thing. I still haven’t had the beer from Olde Peninsula, but I’ll keep going back for the food. I seem to have high expectations for brew pub food and Olde Peninsula hits that mark. Not sure if you’re into pub chips, but OP’s are some of the best. They’re homemade and under a buck. My wife and I were in KZoo last year for a friend’s wedding. We visited Tempo Vino Winery, The Wine Loft and Old Peninsula. They had a great stout on nitro. We also ate the cheese and bacon pub fries. I was pretty impressed with the variety in Kalamazoo of beer, wine and food. We have been talking about going back ever since. Thanks for the review. I use to frequent the OP….untill I figured out that a “pint” of beer was only 12 ozs. I have not been back since.